The figure above illustrated the working principle of direct acting relief valve. When the hydraulic force Fh equals spring force Fs, the valve cracks open, meaning that the spool lifts off its seat and allows fluid to flow to the reservoir. As pressure increases, the spool lifts higher, allowing more flow to bypass to the reservoir. At some pressure level, the total flow bypasses to the reservoir. 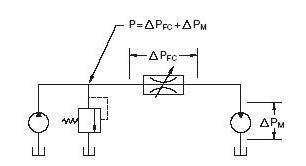 The figure above shows a flow vs. pressure curve for a direct acting relief valve. The valve cracking pressure is set at 1500 psi, at this pressure the valve will start to open and reach to full open at 2000 psi. When the valve is fully open, all the fluid flow is bypassed to the reservoir. The 500 psi differential between the cracking and fully open is the working pressure of the valve. 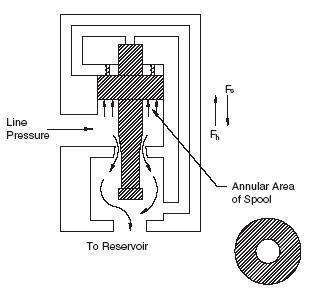 The figure above illustrated characteristics of a direct-acting relief valve. In the schematic above, the hydraulic motor is controlled by an adjustable orifice as a flow control. When the flow control is partly closed the valve output pressure will be dropped. The relief valve pressure is the sum of the pressure drop on the flow control valve plus the pressure on the hydraulic motor. The increasing pressure in the relief valve will force it to crack, the valve will bypass some of the fluid flow to the reservoir; thus, flow to the motor is reduced, and the speed decreases. In the figure above, the fixed displacement hydraulic pump is delivering 10 GPM to the motor. The flow control valve is fully open, and the pressure at the relief valve is 1000 psi. Flow to the motor must be reduced to 5 GPM to cut the speed by half, which means that 5 GPM must flow across the relief valve to the reservoir. The pressure must rise to 1750 psi before 5 GPM bypasses through the relief valve. 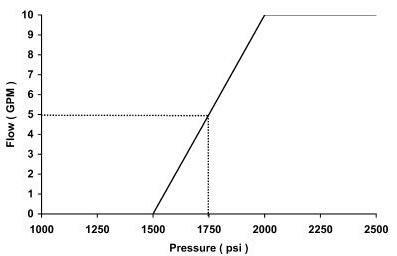 Pressure drop across the motor is only 1000 psi; therefore, the required pressure drop across the flow control valve must be 1750 / 1000 = 750 psi.